I was a little depressed at dinner today. I felt like weeping but I told myself that I am in Florence and I damn well should not cry. I suppose it was a mix of the cold rainy weather and my hormones. But mostly it was the gigantic piece of beef steak that caused me to feel sad. I could not finish my 700gm beef steak. Unlike David who defeated Goliath, I was crushed by a (roughly 350gm) piece of uneaten meat. 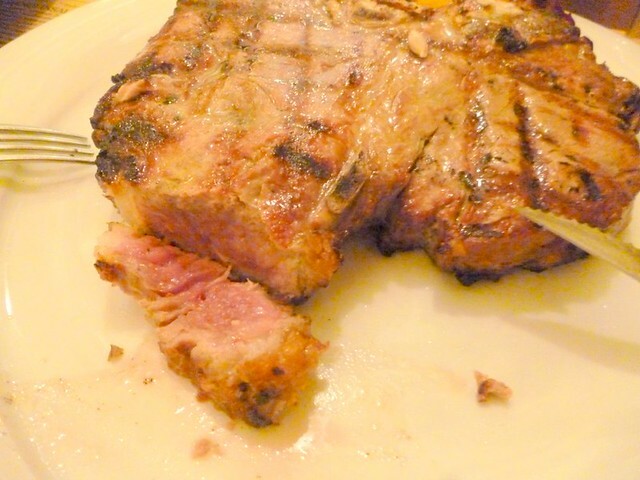 The Bistecca alla fiorentina (beefsteak Florentine style) is a famous dish in Florence. The meat is grilled on wood and served rather rare. I knew I had to try the dish before I leave Florence tomorrow. I headed to one of the restaurants where I previously had lunch. It was still too early for dinner so I was one of the few customers. The restaurant waiter told me that the smallest serving for bistecca alla fiorentina was 700gm. I decided to go ahead even though they have a set meal with 550gm steak and a few sides. The meat that arrived was gigantic. The only company to the meat was one piece of purple lettuce and a wedge of lemon. I knew I couldn’t finish the whole serving but I took the advice of how to eat an elephant (one bite at a time). I squeezed some lemon juice on the whole slab of meat and started with my first bite. The skin had a nice burnt salty crispy taste while the meat was tender. Further away from the sides, the meat became rarer and rarer, pinker and pinker. The dish was quite good since the meat was tender. However, by the time I finished half of it, my body told me to stop or everything else might come back up. So I stared at the steak for a while. I wasn’t sure if asking for a doggie bag was polite in Italy. I didn’t want the dish to go to waste neither and started plotting ways I could take the piece back. In the end the waiter was very understanding and helped me get a takeaway box. I walked in the rain back to the dorm with the steak. In the end, the others in the dorm helped me conquer the slab of meat. That’s where you’re going Mr Meat! Today’s summary: Natural Museum, Pitti Palace’s various museum, lunch + gelato, Basilica of the Holy Cross, Palazzo Vecchio.